The famed surrealist painter came this close to designing a statue that would join the ranks of the Confederate elite on Monument Ave. What kept Dali’s subject from being immortalized on one of Richmond’s main thoroughfares? And, by the way, what ever happened to Dali-land, a theme park to rival Disneyland? It’s a story told by Richmonders for years, passed on by word of mouth and blogs, but specifics have been all but lost–until now. Salvador Dali, famed early 20th century surrealist artist, was close to having a statue alongside the Confederate heroes that overlook Richmond’s beloved Monument Avenue, and the certainty with which that statement can be made is much higher due to the comprehensive research of Kevin Concannon, an Associate Professor and Coordinator of Art History at the University of Akron, Ohio. The addition of a statue on Monument was a debate started in 1965. A city commission was established to handle the issue. Original plans for additions put more Confederate heroes on the bill, but Clifford Doughty, a Richmond resident and Civil War Historian, uttered the first breath of opposition. Harry Kolatz Jr, Senior Writer for Richmond Magazine, researched the subject for a play he produced in the late ‘90s, “The Persistence of Memory.” Kolatz said Doughty’s vision was the stepping-stone toward establishing a new kind of statue. The Reynolds family, owners of Reynolds Metals, donated heavily to public statue work throughout the country as a way to market their anodized aluminum which could be dyed to any color. Roland Reynolds offered up 1,000 pounds of the colored metal for the proposed sculpture project. Reynolds added an additional requirement for the competition – the statue had to commemorate Civil War hero Captain Sally Tompkins. Tompkins, born in Matthews County, VA, in 1833, moved to Richmond after the death of her father. Before long, war had broken out and she saw the wounded pour into the city. Tompkins persuaded a judge living at 3rd and Main streets, at what is currently the 3rd Street Diner, to turn his house into a makeshift private hospital. According to an United Daughters of the Confederacy Magazine article about Tompkins, “With her medicine chest strapped to her side and her Bible in her hands, she flitted from duty to duty, ever ready to ease pain or relieve a distressed soul.” Using her inheritance, the hospital became known for his low casualty rate. In 1862, when a Confederate decree required all private hospitals be turned into public institutions run by army officers, the future of Tompkins’s hospital was put into question. To get around the rule, Tompkins was commissioned a Captain, effectively making her the United States’ first Female Army officer. The statue project had materials from Reynolds and a subject that fit the bill — a peacekeeper to cap the line of warriors — but the question remained, who would design and build the monument? Specifics of how Dali got involved with the Reynolds were some what of a mystery for some time. Conannon, through a series of interviews with former Reynolds employees and Captain Peter J. Moore, Dali’s “military advisor,” and exhaustive newspaper and private collection research, appears to have cracked the code. Dali was staying at the Saint Regis Hotel in New York City around the same time as Lewis Reynolds, a member of the Reynolds family. They met at a bar, and it’s here Concannon found his first evidence of the connection – a cocktail napkin with a freehand sketch of the Reynolds logo signed by Dali. Dali was commissioned by Reynolds to design a series of attractions for a theme park on land owned by the Reynolds. The land in question would later become modern day Disney World. Concannon believes the Reynolds/Dali theme park, tentatively called “Daliland,” was a scheme to get some leverage over Disney, to increase the value of the land. It also gave Dali a chance to “stick it,” as Concanon put it, to Disney after the fiasco over a Dali and Walt Disney short called “Destino” which was not released in Dali’s lifetime. “One of the attractions was going to be a simulated womb, so people can enter their mother’s womb,” said Concannon after reviewing a copy of the contract retrieved from the Reynolds estate. Dali sent Captain Moore to Richmond in March, 1966. Moore appeared with a model on one arm, and an ocelot, on the other. He met with the City’s statue commission and told them, according to a Richmond News Leader article, “Dalí sees (Captain Sally) as a kind of modern St. George and the dragon. The facial likeness would be as near as possible to Captain Sally, but the form of the actual body would depend on whether she wore a uniform or not. And she would probably carry a shield inscribed with the Confederate flag…Probably the dragon will be an enlarged microbe of some kind, not the standard dragon of medieval times.” The entire structure would sit atop a 20-foot model of Dali’s pinky finger. The dragon-fighting image was a tribute to the Reynolds family and company, whose logo was and still is a rendition St. George fighting the dragon. Moore left Richmond, and phoned in details for the actual sketches, which were drawn by Bill Wynne, the art director of the add agency handling the Reynolds Moon Pie account. 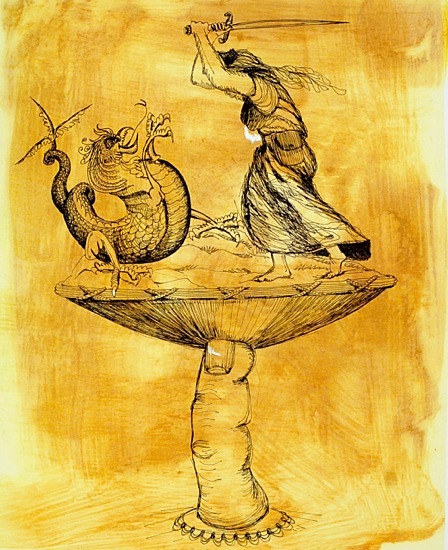 This image (above), detailed, but plain and formal, is often confused to be a Dali original. Moore defended Dali’s idea saying Tompkins would have been “Joan of Arc on horseback killing the dragon – like they have in Genoa, like they have in Barcelona, Like they have in England.” But there were no takers from the city or the city’s statue commission. The ensuing controversy over the image, the Sally Tompkins statue was abandoned along with the entire addition-statue project. Scott said such a sculpture would have contradicted contemporary art movements as well. This, combined with Dali’s waning significance, could have added to the unlikelihood of such a project ever seeing completion. Brad Kutner is a freelance journalist living in the Bellevue neighborhood of Richmond’s Northside. He is a regular contributor to Pacifica’s Free Speech Radio News, and is a volunteer manager with WRIR 97.3 LP-FM. He specializes in reporting on local politics and the environment, but spends most of his time looking at food blogs with his tiny dog in his lap. There are 5 reader comments. Read them.